Midlands Plumbing provide experienced civil plumbing services in Tasmania. Our plumbers provided major civil works on the completed Launceston Airport-Southern Apron Reconstruction. Building approvals for construction activity on the Launceston Airport are issued under Commonwealth law and are subject to regulations under the Airports Act 1996 (Act) and Airports (Building Control) Regulations 1996. “Building activity” in this scenario included earthworks, fire systems, civil works including roadworks. Midlands Plumbing completed all of the above meeting all the relevant regulations for airport construction. This project was the airports second largest infrastructure investment since being privatised in 1998. 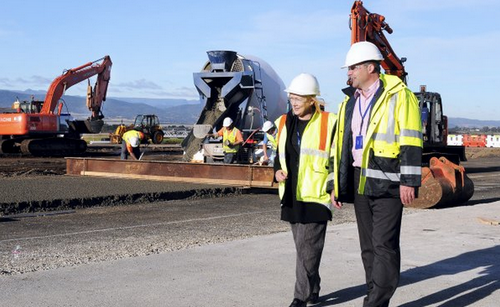 Launceston Airport general manager Pamela Graham and project manager Ray Brown inspect progress on the apron. Image & caption from The Examiner. Contact Midlands Plumbing in Tasmania for civil plumbing services. We work to the highest safety standards on all jobs including large-scale projects.